Earlier this year, I went through the minor trauma of having to toss my iPod. It went through some mysterious illness that ruined the hard drive (suspiciously, the same thing happened to my computer a month or so ago as well). It might not have been such a tragedy, but I’d never backed up those 40 gigs of music, podcasts and audiobooks, and subsequently lost it all. But I’m never too put out by losing “stuff”. In fact, I view these times as opportunities to clean out the clutter, and over the past half year, I’ve been slowly refilling my iPod with the things I remember enjoying most. Among these is a career’s worth of albums by David Bowie, that master of reinvention, and often brilliant creator of pop songs. The Rise and Fall of Ziggy Stardust and the Spiders from Mars has been filling our apartment a lot these last weeks. Ziggy is glam’s Sgt Pepper. You can argue that one album is better than the other, but the similarities are striking. Both chart the life and career of a fictional musical prodigy—one an old-time Englishman, the other a star-time extraterrestrial. Both albums are conceptual, though neither is bound too much by its concept. And of course both albums are filled with fantastic songwriting. “Five Years” “Moonage Daydream” “Starman” “Hang Onto Yourself” “Rock ‘n’ Roll Suicide”…et cetera. What I love about Bowie, even when I don’t necessarily love all his songs, is the fearlessness and creativity that imbues all of his work. 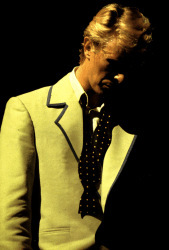 When he changes character, as he did at the end of the Ziggy era when he moved over to Berlin to go all Germanic, then again in the eighties with his huge white jackets and puffy hair—and even again when he went slick and minimalist with Tin Machine—when Bowie changes, he changes wholeheartedly. When he reinvents, it’s a true reinvention, not just a different hairstyle. Writers also change. While sometimes it’s a creative choice, it’s often a market decision. Authors don’t have to fret over the clothes they wear, because people hardly bother with author photos, and we no longer get lengthy Life Magazine spreads. Writers reinvent by switching genres, switching narrative focus, and sometimes even by changing their names. I bring this up because it’s been on my mind lately. My Cold War series is finished, this next year will see its completion in print, and I’m working on something that I want to be different in many ways. Tone, locale, character types, and plot structure. Other things too, but these are the central changes. Though I’ve had my fair share of critical attention over these last years, my sales have dropped year by year. It’s been a puzzling and worrying phenomenon, particularly when I believe my writing has gotten better with each book, and the reviews have pretty much confirmed that. My publisher works hard to get my books out there too. So what’s the problem? It’s hard to say, though I tend to fall back on the supposition that communist-era thrillers with Eastern European main characters (Alan Furst’s romantic intrigues aside), told in the way I tell them, don’t really have much of a market. Or maybe it’s simply that the Lady Luck of Marketing hasn’t chanced upon my career yet. Either way, my career so far has been a critical success and popular failure, and I’d like that to change. So, like Bowie, I’m trying to reinvent. I haven’t yet seriously considered a pseudonym, instead focusing on the feel of this new book. Characters from my own homeland, locales a little more familiar to readers (in this book’s case, I’m starting in Western Europe), and a plot structure that—one hopes—thrills from the start and pulls you along, while still hopefully maintaining the critical recognition. 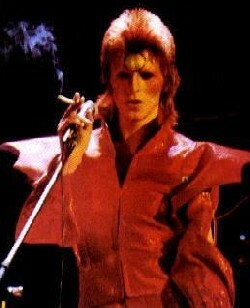 Listening to Bowie, with his inspired creations and recreations, I keep feeling the urge to push it further. New name? Why not? Fresh author photos in the severe, otherworldly style of Man Ray’s portraits? That sounds fun. And an entire fake biography to this new name…an extraterrestrial bio? Sillier things have been done. And interviews done in character, with wild pronouncements about how the world is going to end in Five Years? It sounds like a blast, though I doubt I’ll do any of these things. It’s hard enough just writing a good book. Which is why I respect Bowie so much. He not only produced classic songs, but he took control of every aspect of that career and its public face. As the writers out there know, it’s so hard to feel like you have any control over any of this. We can pump up our web sites or, if we live in our home countries, do some in-store self-marketing—but these things feel like drops in an ocean. But we might as well try to stretch our imagination, and see what comes of it. I don’t know what, if anything, I will do, but I might as well go buy a wig. A head of hair isn’t a bad first step.